There are to many image resizers in this world. I think that's a statement that I would immediately sign. If you develop a new image resizer you will have to offer additional features and value that others do not provide. Imgares comes with a few that are not that common. But first things first. 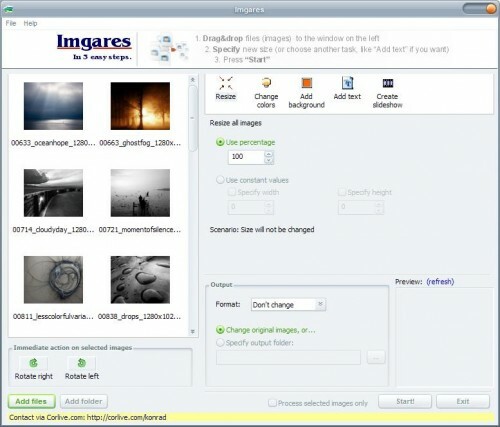 The software supports batch resizing of images that can be dragged and dropped into the program interface. Users who prefer to browse for their files can do that as well. The images are then shown as thumbnails in the left pane of the application and the user can tweak a few settings before he hits the start button. It's possible to rotate the images, select an output folder and chose if the images should be reduced by percentage or constant values. It is also possible to change the output format to another image format. Add Background - Adds a background color to the image and increases the size of the image by a defined margin. Add Text - Text can be added to the images.Colors, Fonts and alignment can be selected. Change Colors - Change Light, Contrast and Red, Green & Blue values of the images. Create Slideshow - Creates a movie (avi) slideshow from the images with transition effects. Imgares is definitely not the usual image resizer. Especially the movie slideshow feature is something that is not that common. or old good Faststone Capture 5.3 where you could see projected size of image to save, and sample of processed image to evaluate quality of its look after compression?